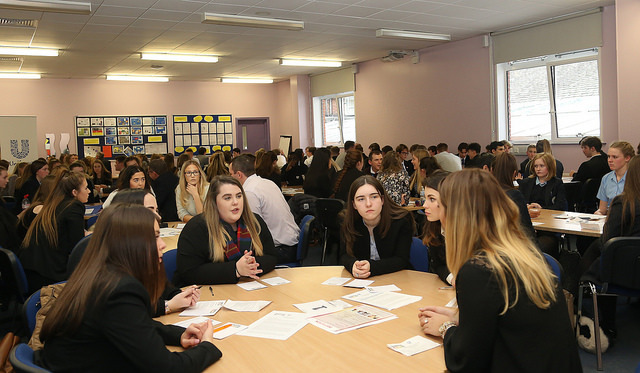 Education and Employers partnered with Unilever to host a special ‘Inspiring the Future’ event at Wirral Grammar School for Girls, Bebington, designed to inspire pupils to think about their futures and get a glimpse into the range of opportunities available to them in their careers. You can view a selection of photographs here. See the Wirral Globe press coverage of the event here. 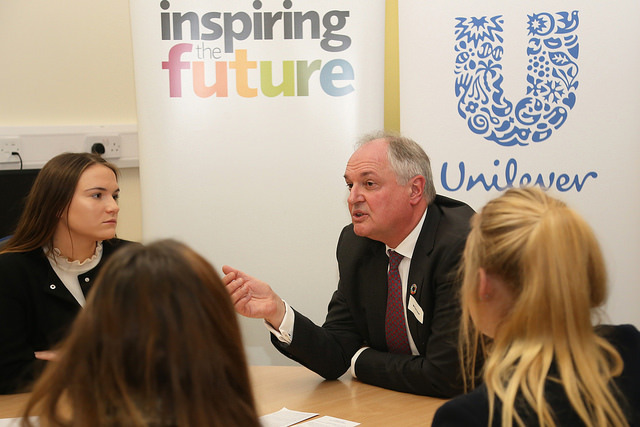 The event was opened with an incredibly inspiring speech from Unilever’s CEO, Paul Polman who spoke to a busy room of 150 young people from local State Schools. Joining him were 35 Unilever volunteers – ranging from apprentices to experienced employees at the peak of their careers – to share their experiences with the students and answer questions about their job, career journey and educational choices. The event aimed to introduce young people to the diverse range of opportunities available to them, and break down stereotypes by giving students the chance to meet women and men in a range of roles, some of which might previously have been slanted towards a particular gender. The inspiring mix of volunteers, included female engineering apprentices, Scientists, Project Managers and also Alumni from Wirral Grammar School for Girls. It is hoped the event will inspire other employers to partner with ‘Inspiring the Future’ and connect their employees with school students, who benefit hugely from understanding a broader range of career opportunities. Both Unilever and our charity hope this event will help to raise awareness of the amazing volunteers that are already available to schools in the area and encourage other people to volunteer. A report published today by the Chief Inspector of Schools, Sir Michael Wilshaw http://www.bbc.co.uk/news/education-38155858 highlights the need to do more to inspire young people and give them access to role models in Liverpool and neighbouring areas. The event in the Wirrral follows on from a number the charity has done in coastal areas. Following the launch of our Primary Futures campaign in Blackpool, we are continuing to reach out to deprived coastal areas where career aspirations may be low and employer engagement in education can be vital to encouraging students to aim high. Thank you once again to all Unilever employee volunteers for attending to ensure another wonderful event. If you’d like to register with Inspiring the Future as a volunteer or on behalf of a school visit our website ee-itf.helpful.ws. View the photos from the day on our flickr.